A summer in Sydney is hard to beat! And what better way to spend it than at a rooftop, swimming in a pool with the view of the city skyline and famous monuments. 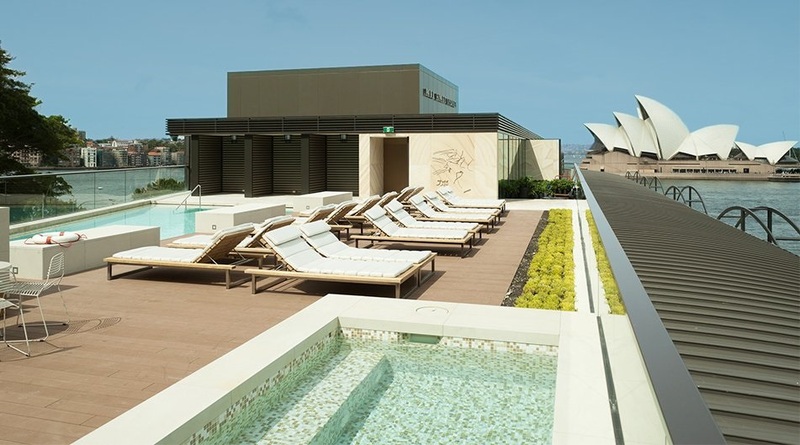 This list is made so that you could find your favorite Sydney rooftop pool to relax at. 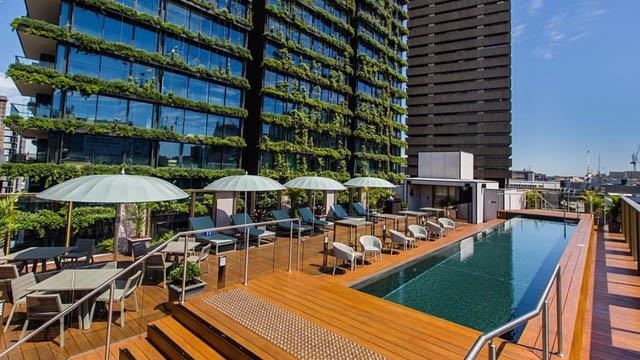 There are quite a few rooftop pools in Sydney, but don’t despair, we have made a list of the 5 best rooftop pools Sydney has to offer here. And if you rather drink with a view you can find the best rooftop bars Sydney has available here. Park Hyatt Sydney is one of the most luxurious and private rooftop pools you can find in this city. With beautiful views of the Opera House and the Sydney Harbour, you’ll feel like you’re right in the middle of everything here. But despite the central location, this is an oasis in the middle of Sydney. The terrace is equipped with a large and heated swimming pool, a spa, cabanas and a private sun deck. 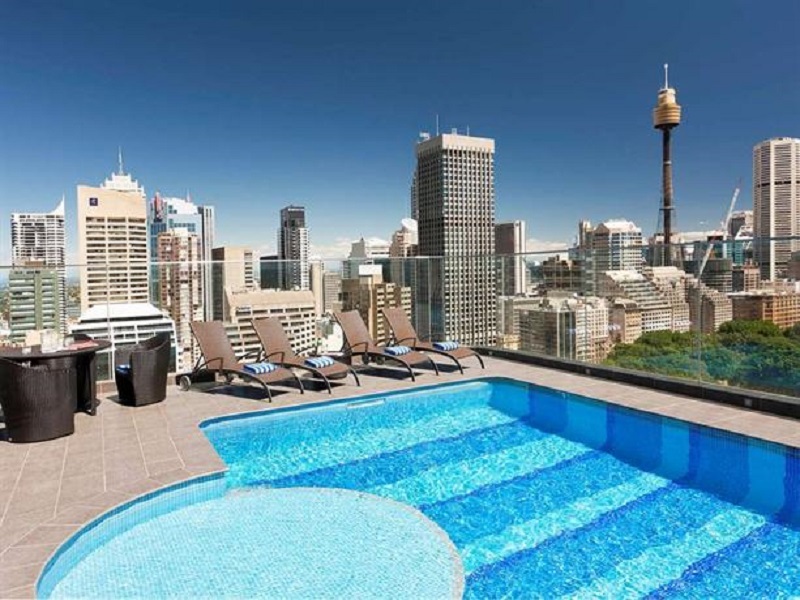 Unfortunately – like almost all other Sydney rooftop pools – it’s only available for the guests of the hotel. The swimming pool only, makes it well worth for staying at the Park Hyatt Sydney. A famous rooftop pool in Sydney because it’s been featured in several movies and TV shows. The swimming pool at Pullman Sydney Hyde Park is super luxurious and with premium views in the central parts of Sydney amidst the downtown skyscrapers. The rooftop pool is only available for the hotels guests. Theres a spa in addition to the pool for those who’d like to relax with some treatments between all swimming. The best thing here though, is the breathtaking view of the city rooftops. Majestic and beautiful at the same time. One of the biggest rooftop pools in Sydney. The Astral pool is both big and well designed, making it look very luxurious and inviting. 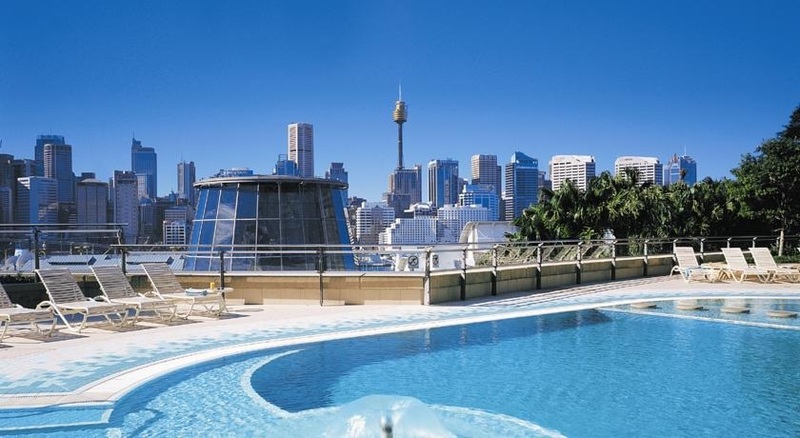 The same goes with this Sydney rooftop pool, you must be a guest of the hotel to be able to use it. As a guest you’ll have complimentary towels, newspapers and water all day long. And if you forgot your swimwear, you can buy a pair of new ones right by the pool. When swimming in the rooftop pool or just relaxing in a sun lounger, you’ll get the best skyline view of Sydney from here. Absolutely magical and great for the eye. The rooftop swimming pool at InterContinental Sydney Double Bay is one of the smallest in Sydney. But what it lacks in size, it delivers in views and harmonious atmosphere. Unlike many other rooftop pools in Sydney and the world in general, this pool is also open for non-hotel guests. But only between October – March from 11:00 PM – 1 hour after sunset. The terrace is also equipped with comfortable sun loungers and a rooftop bar serving delicious cocktails all day long. A great choice if you like a Sydney rooftop pool a little bit outside of the city center, but still with amazing skyline views. One of the newest rooftop pools Sydney has to offer. The Old Clare Hotel rooftop pool is perched on the roof of this luxurious hotel, with bird’s eye views of the city and its rooftops. A sophisticated roof terrace with a harmonious atmosphere. Only available for the guests of the hotel. But as a hotel guest you’ll enjoy towel service, a lounging deck, fitness activities and a heated rooftop pool. The fact that it’s heated makes it worth to visit it all year around. Book your stay here and enjoy one of Australia’s most sophisticated rooftop pools at The Old Clare Hotel.